Guru also known as Brihaspathi (Jupiter); it is a benefic planet and is the Guru of the Devas. Lord Guru was born to the Saint Angiras, who is the son of Lord Brahma and Chiratha devi. It takes 12 years for Guru (Jupiter) to complete the full zodiac signs. In each house it stays for one year. The movement of Guru from one house to another house is called Guru Peyarchi . Guru is responsible for Marriage, Children, Fortune, Wealth etc. If Jupiter is in a good position like exalted or in its own house, then the native will be an influential person, will enjoy all benefits and happiness. They will do impossible things in a possible way. If Guru is not strong in one's horoscope, they will have to undergo all difficulties in life. Monetary conditions will be unsteady and obstacles are seen in their life. 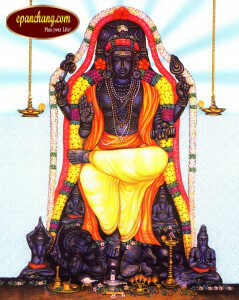 Guru is the Lord for Dhanus rasi and Meenam rasi. With the exception of Surya and Chandra, all other planets are Lords for two rasis. The results or outcome of his stay in a rasi [during Guru Peyarchi ] is based on his focus on the other rasis. It is all based on the Ganitha sastra.